The earliest records of Rhubarb date back to 2700 BC in China where it was cultivated solely for medicinal purposes. In the 14th century “medicinal” rhubarb was imported along the Silk Road. At the time, because of the difficulty of transportation, it was more precious than cinnamon, opium or saffron. 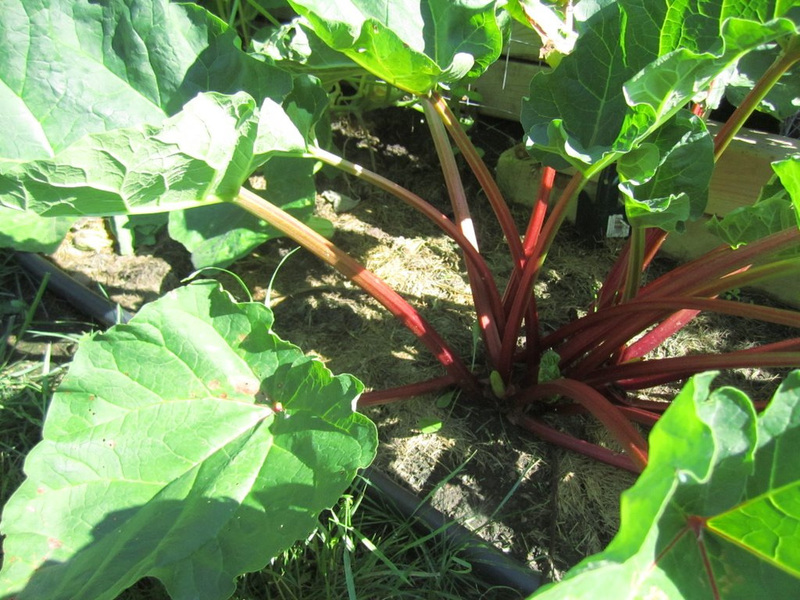 The use of rhubarb as food began in 17th century England after sugar became more affordable. It traveled to America around 1800 when an anonymous Maine gardener obtained seed from Europe. Sadly, rhubarb's popularity declined after WWII when more exotic fruits became available. In her books, Laura Ingalls Wilder referred to rhubarb as, “pie plant," the common term for it at the time. Because of its close association with pies and desserts, rhubarb is commonly mistaken to be a fruit. However, rhubarb is actually a close relative of garden sorrel, therefore a member of the vegetable family…except in New York, apparently. In 1947 a New York court decided that since rhubarb was used as a fruit it should be considered a fruit for the purpose of regulations and duties. Perhaps the incentive for the botanical decision was partly related to the fact that tariffs on fruits were less than tariffs on vegetables. thawing slightly and adding 2 liters of ginger ale. and add ginger ale right in the pail. Makes 4 qts. colander but do not stir, just let it drip. Combine topping and sprinkle on batter before baking, if desired. Bake at 325° for 30 minutes. Pour batter into three prepared loaf pans. Bake at 350° for 60-75 minutes. in an 8 x 12 inch pan. Mix the dry ingredients and sprinkle over the batter in pan. Pour boiling water over all. Bake for one hour at 375°. Spread cherries and rhubarb in 9 x 13 inch pan. Sprinkle with sugar and dot with butter. Cream shortening and sugar, Add egg and beat well. Combine flour and baking powder and add alternately with milk to creamed mixture. Pour over fruit. Bake 50-60 minutes at 350°. Serves 12. Combine filling and let stand for 15 minutes. seal and cut slits. Bake at 400° for 50 minutes. Blend sugar, flour, nutmeg and butter. Add eggs and beat smooth. Pour over rhubarb in a 9 inch pie plate. Cover with top crust and bake 10 minutes at 450°. Reduce heat to 350° and continue baking 30 minutes. crust and bake at 400° for 35-40 minutes. design for top crust. Bake at 375° for 45 minutes. In heavy-bottomed, non-reactive pan, heat milk with herbs and lemon zest. Remove from heat, cover, and let stand for about 30 minutes. Add sugar to milk-herb mixture and gently reheat to dissolve sugar, stirring occasionally. In small bowl, lightly beat eggs with egg yolks and pinch of salt. Pour or spoon about ½ cup of warm milk into eggs and whisk to incorporate. Then add all of milk to eggs and blend well. Add vanilla. Pour custard mixture through a strainer to remove herbs, zest and vanilla bean, pressing them gently to remove their essence. Pour custard mix evenly into custard dishes. Carefully fill pan holding custard dishes with hot water. Place pan in oven and bake custards until they are set, about 40 minutes, or until knife inserted in center comes out clean. Remove custards from hot water and place on baking rack to cool. Serve warm, or cool and refrigerate. Combine rhubarb, orange juice, sugar, vanilla bean and nutmeg in large, heavy-bottomed, non-reactive saucepan and place over medium-high heat. Stir, cover and bring to simmer, which will just take a few minutes. Remove lid, stir well and reduce heat to medium. Cover and cook 5 minutes. Remove lid and stir. Remove vanilla bean pieces before serving with vanilla ice cream or fresh whipped cream. Serve warm or at cool room temperature.